It can be frustrating to have a room that seems to have all of the elements one should need—such as a beautiful couch, a nice wall color, a lovely rug—and yet something is still missing. Sometimes our houses can be a bit like a puzzle with all the pieces in the box, but the thing just isn’t coming together. Erin has made a career out of helping her clients employ simple changes such as rethinking furniture placement, creatively reworking accessories and family heirlooms that are on hand, and adding just the right decorative details to finally make things become cohesive and pulled together, both in function and style. 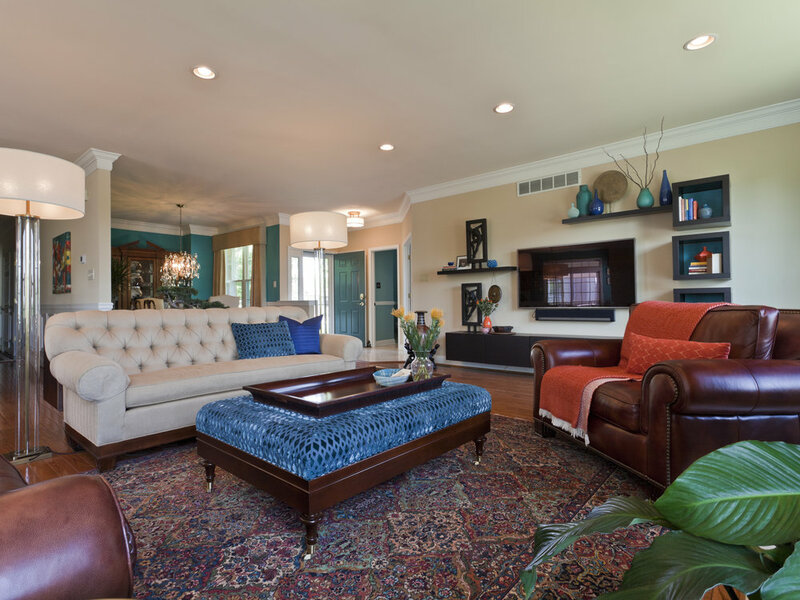 My husband & I had struggled with a frustrating, odd-shaped living room for years. With full glass windows on one side and such a big open space, we found it very difficult to furnish. We could never figure out how to make the room work. Erin stepped in and was able to create the vision for how the room could function and still be beautiful. Without her help in the past, I purchased furniture that was the wrong size, placed it incorrectly, and my husband then peppered the room with an additional mishmash of furniture. It was chaos. However, with Erin’s guidance, the space is now pulled-together, with defined spaces, and it functions beautifully for all of the activities that we do in that space—living large when we are entertaining, or cozy and intimate when we are just watching tv on a quiet evening.